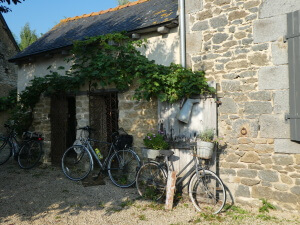 This September we returned to Brittany on our bikes after an absence of three years. We parked our car at Portsmouth’s Ferry Port multi-storey car park and travelled overnight to St. Malo. The crossing was calm and we chatted to other cyclists- most, I imagined, planning a route further than ours. 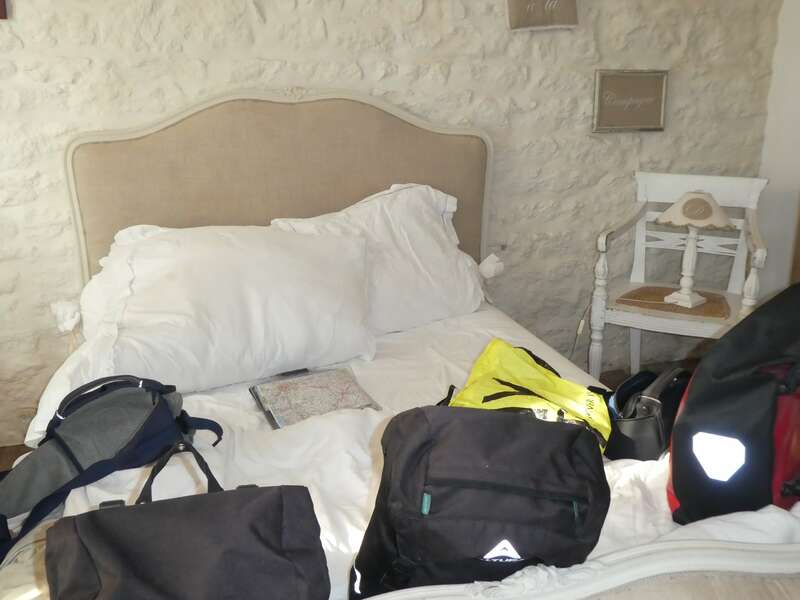 A couple of 18 year-olds were following a route with the aid of their mobile to Bordeaux, booking b&b as they went. Another couple were going to stay in a cottage in Dinan, the woman riding an electric bike and carrying the luggage and he on a racer. I love being part of the community of cyclists comparing experiences. The moment when we left the port we got lost as usual. This time we couldn’t find small ferry which would take us to Dinard. It was an opportunity for me to confuse the French by my not-quite-French accent and words, and hand gestures. The far bikes are ours! This time we were crossing the River Rance to Dinard and from there cycling along the greenway to Evran. The scheduled ferry had been put back an hour so we’d baguette, butter and jam with coffee at a restaurant just inside the wall. Though it was only 8.30 it was warm enough to sit outside. 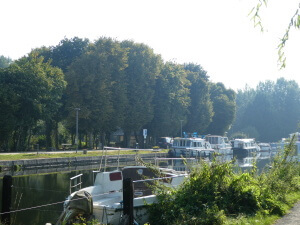 The first part of the Voie Verte took us through woodlands, a short stretch of tarmac road and then along the canal to Dinan. While we were having lunch by the canal in the sun, a couple we’d met on the ferry stopped to chat. The bed in the chambre d’hote was welcome. Unfortunately I didn’t feel well and recognised the distressing signs of cystitis. Our host warned the pharmacy would close in 15 minutes (luckily she was wrong) and I tore uphill faster than I’ve cycled for years. The pharmacist advised the doctor. Another opportunity to practise French and more good fortune- he prescribed antibiotics which gradually worked. Being of cautious dispositions we chose not to travel on another 20 miles or so as we’d intended, but to return to Dinan. To say I was disappointed was an understatement. I’d been looking forward to the new route, the promised quiet paths, conversation with local people and other tourists that I hoped lay ahead. However, other than the very very steep climb from the river to the centre of Dinan the journey back was uneventful. Dinan is beautiful. Previously we’d rushed through. 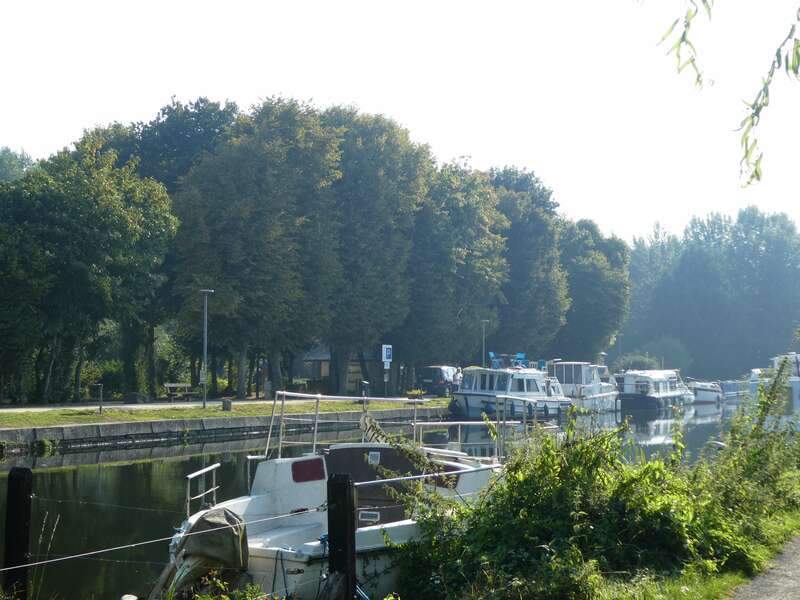 This time we booked in for 2 nights and took a boat ride on the Rance which was entertaining, as much from the guide as from a group of men from Yorkshire who knew more about the river/canal than the French till we were actually on it. Two days later we returned, cycling against the wind, to St. Malo. During our three day stay we found one of the long-distance cycle routes, which took us through the pretty port of Saint-Jouan-des-Guerets. 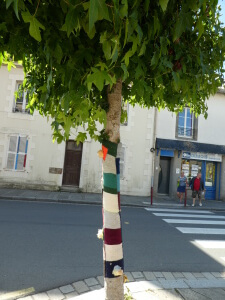 Sadly the road was steep as coastal roads often are, but on the main street the tree trunks were decorated with knitted sleeves. I thought the trees might be diseased. 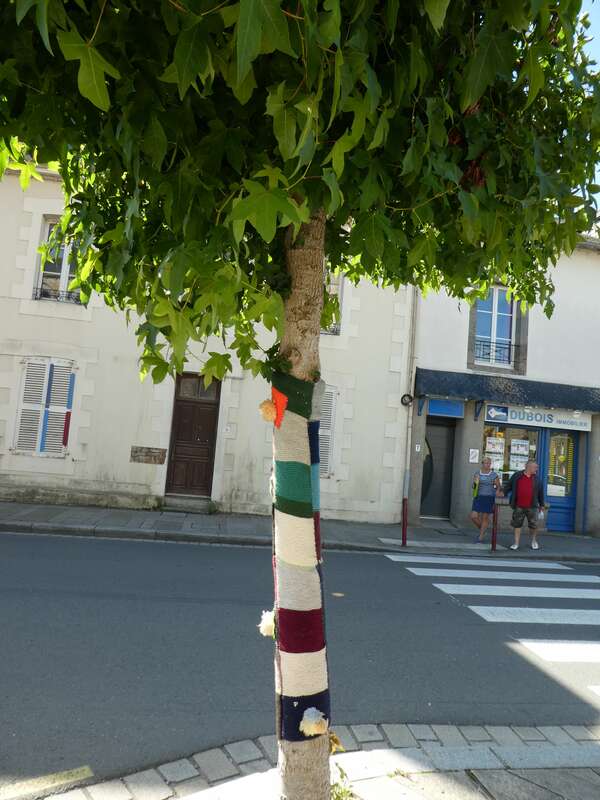 No – a local group of women wanted to attract potential knitters to their group. 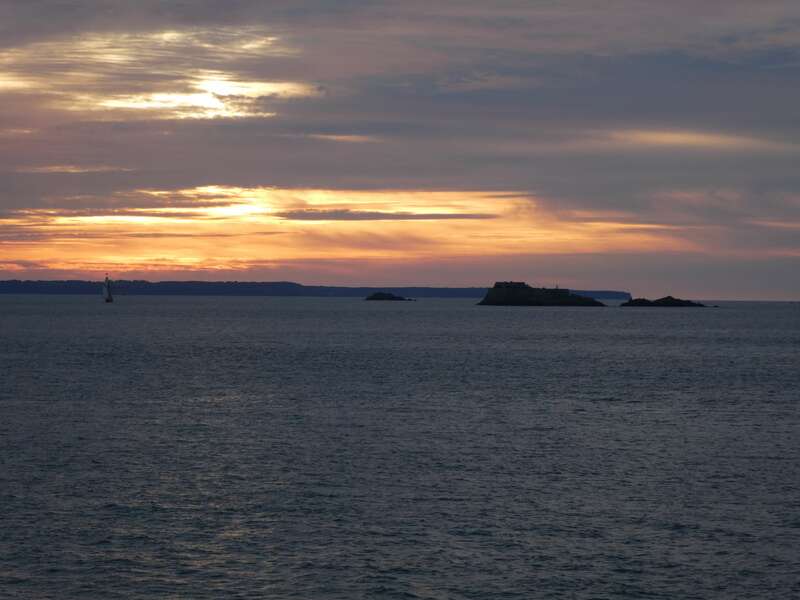 We’d previously rushed through St. Malo on our way further into Brittany. The adjustment to our holiday meant not only appreciating the approach on the ferry and a quick walk on the beach. This time we walked round the walls, watched tremendous sunsets – the roof tops get in the way at home- and I went round an inspiring photo exhibition, ‘Somewhere’ by a local artist. Although the holiday wasn’t as adventurous as I’d hoped, it was good. We returned home fit, rather than exhausted, and relaxed enough to be planning the next one! It is true that as with most of France vegetarianism is rare in Brittany, but having said that the local delicacies of Crepes, wonderful salads and the ubiquitous (and excellent) pizzarias mean you won’t starve and most restaurants have ceased to call a bacon omelette ‘vegetarian’. French beer is usually the fizzy, strong ‘Euro Lager’ of which I’m not a huge fan, but Brittany boasts several breweries (e.g. Coreff) that make excellent beer. As you cycle through the countryside you’ll pass the apple orchards that produce some of the best ‘cidre’ in the world (and an evil spirit called Eau de Vie), really refreshing on a hot day. As for wine very little is produced here, but that doesn’t mean that you can’t get a perfectly drinkable bottle of ‘plonk’ for a couple of Euro!